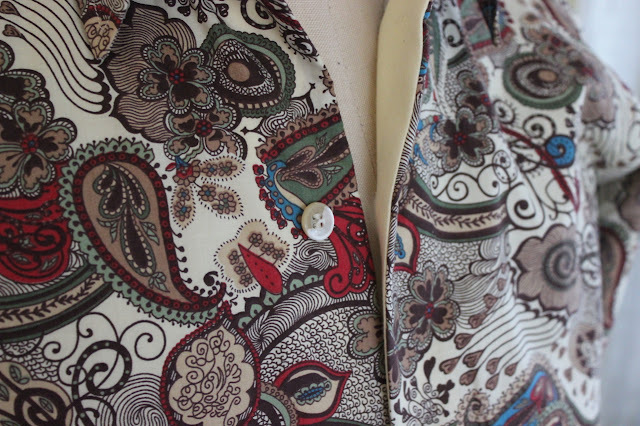 male pattern boldness: My New Paisley Shirt -- from 1942! Just look at this fabric! I loved the intensity of the colors and the bold design (the quintessence of male pattern boldness, no?). I knew I'd eventually make it into a shirt, but when I learned over the weekend that Pam would be in NYC this week and we'd be having dinner on Tuesday night, I realized it was time to get to work! 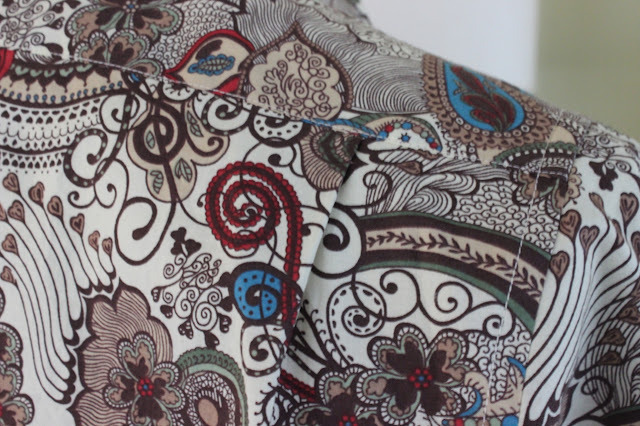 One of the highlights of this shirt pattern is this beautiful collar stand piece (below). You don't see these subtly shaped collar stands anymore. The sleeve is interesting: very rectangular. Notice that the placket slit is pre-cut. 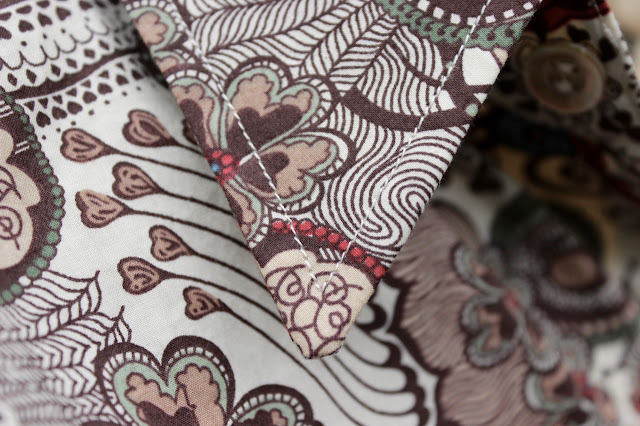 The pattern calls for a two-piece placket, which allowed me to use my contrast fabric for the underplacket. First time I've ever done this. My contrast fabric is butter-yellow cotton shirting left over from a shirt project from a few years ago. I wanted a solid for contrast to give the eye a resting place; I think it works well. Another interesting feature of this pattern is that it has a separate facing piece for both left and right fronts. I used the same solid yellow for both facings (as well as the inside yoke). 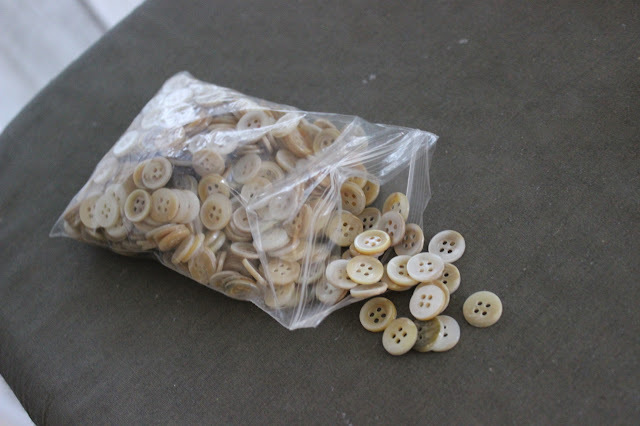 My mother of pearl buttons were a generous gift from MPB reader Shirley S, who sent me an entire bagful! 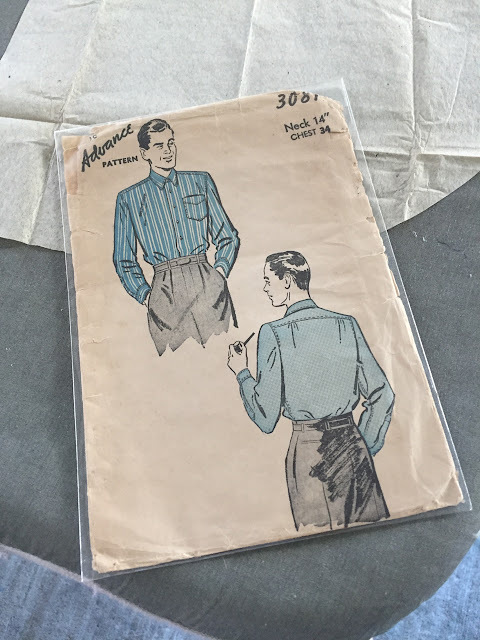 The only alterations I made to the original pattern were to shorten the length by 2" and to turn the back gathers into small pleats (below), as gathers never press properly. I also left off the single breast pocket. So what is the difference between a men's shirt from 1942 and one from 2015? The collar is a bit sharper, the collar stand slightly wider (which suits my longish neck) than you find today. The armhole is (arguably) a tad higher and the sleeve below the elbow a little fuller. That's about it. Does anything about this shirt scream 1942 to you? 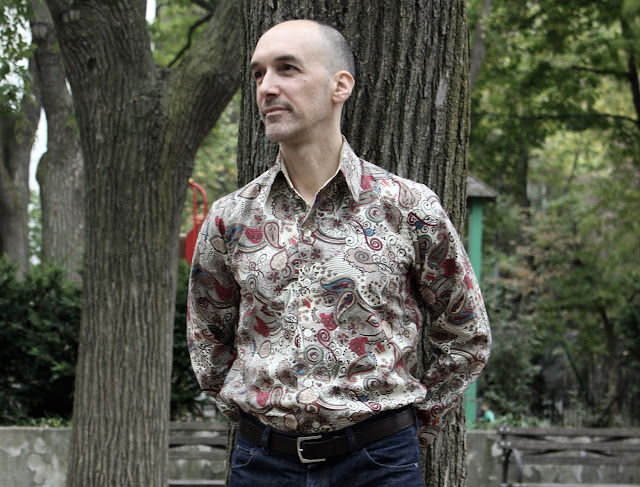 I made this shirt entirely on my Elna Grasshopper (with the exception of the buttonholes, which I made using my vintage Singer buttonholer on my Singer 201). Love my Grasshopper! 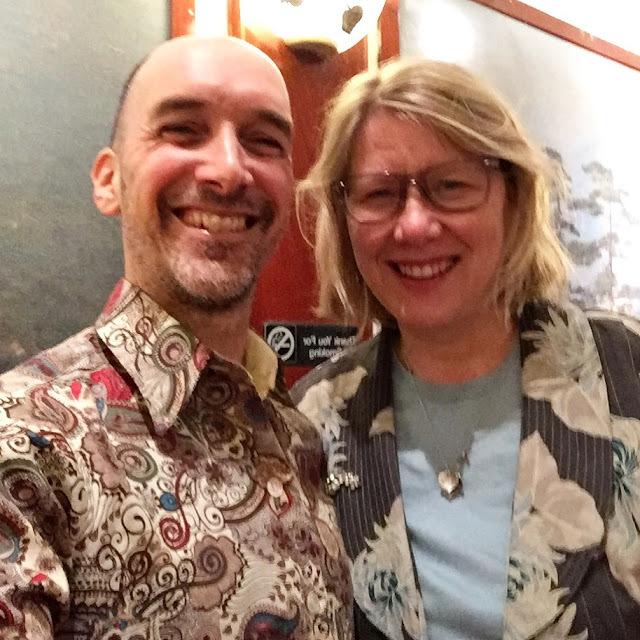 I debuted my new shirt last night when I met Pam for dinner. We shared some fantastic Chinese food at a wonderful restaurant on my block, Grand Sichuan. So much fun! Thanks again, Pam -- and Shirley -- for your generosity. I really appreciate it. The sewing community is a great one. You received a fantastic fabric and buttons, you made a fantastic shirt, then you had dinner with one of the fantastic donors. When you started MPB did you foresee the ripples in this great big pond of love? No, but I enjoy swimming in it! Wow! love the shirt and the generosity of Pam and Shirley. And your generosity for sharing and posting here. The contrast on your shirt reminds me of the 'Carnaby' styled shirts popular in my youth... mid-60's era. After stripes, I think paisley might be my fav. And thx for background on Advance Patterns too. As always - love this shirt. Great story. 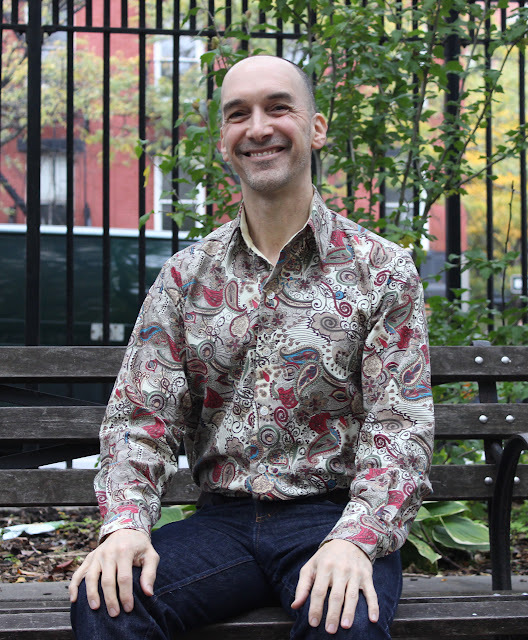 Fun story, fantastic fabric, and gorgeous shirt! Peter, I love your collar with the contrast yolk. 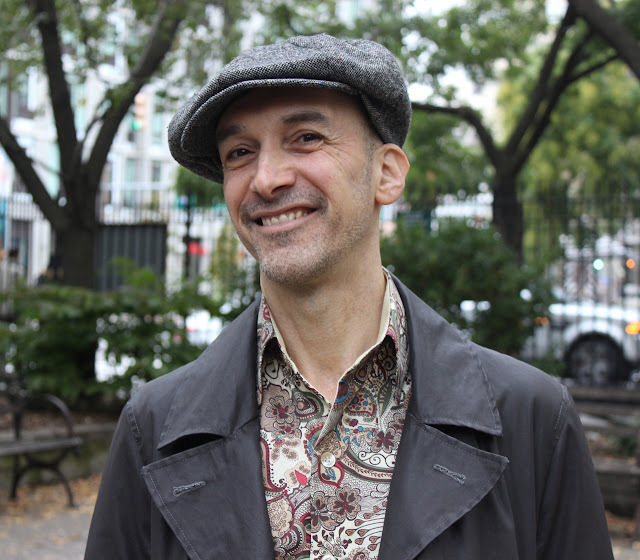 Can you do a post about how you construct and attach a collar to a shirt these days? I'd love to see your technique. I concur! Would love to see the step by step! 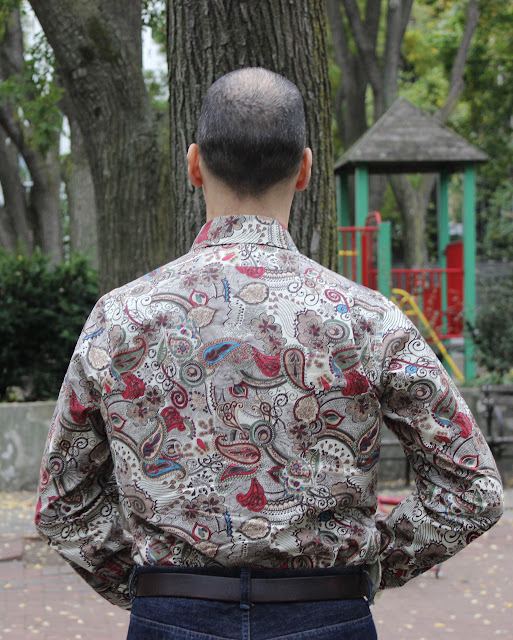 Fabulous shirt and the fabric is gorgeous. Great eye-catching fabric and shirt. The drawings on the pattern envelope show the shirt with shoulder pads. 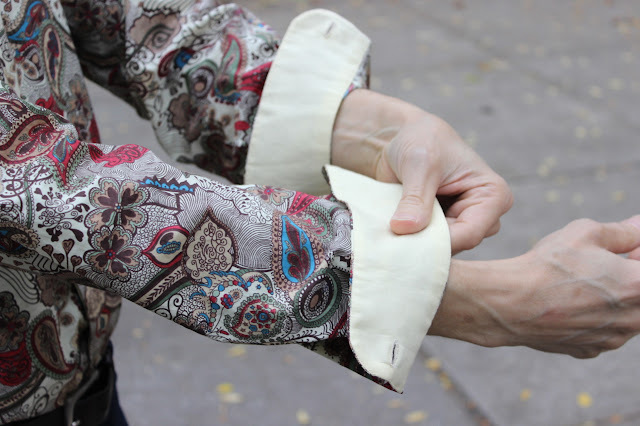 Have you ever experimented with shoulder pads? A quarter inch, a half inch just to see what happens? I think those men are just reflecting the square-shouldered ideal of the times; the pattern does not call for pads. I'm not really a shoulder pad person, I prefer a natural shoulder, even in suits. You might benefit from some quiet reflecting time with your "inner-Joan Crawford". Notable to me is how many male celebrities shirts/sweaters these days seem to be to have "technically augmented" shoulders. Men's natural shoulders -- on the average -- are MUCH more rounded than women's natural shoulders. Yet in the celebrity version of shirts/sweaters much less so. Even, incomprehensibly, in cashmere sweaters and sweatshirt cotton. Shoulder pads? It's just a thought. Wow, what a wonderful shirt! So glad you're using the buttons and they are period appropriate to the pattern! That fabric is totally fabulous and the shirt looks gorgeous on you. That is a good looking shirt! And your top stitching is always so pretty. I'm blushing. It was such a treat to talk sewing and life with you. 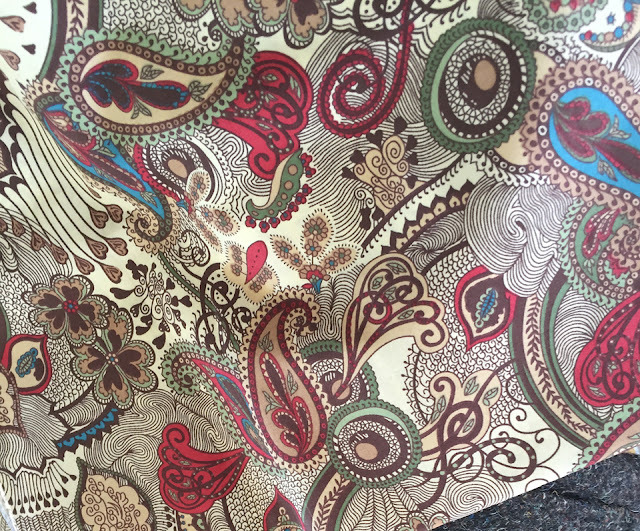 And seeing the paisley so wonderfully transformed was a thrill. I wish the lovely lady who sold the fabric to me on Goldhawk Road could see it. Maybe she will! As Mouse said above, the sewing community is a wonderful one. And MPB is a special nexus of inspiration and joy for so many of us. Thank you, Peter! Beautiful shirt and a very nice post. 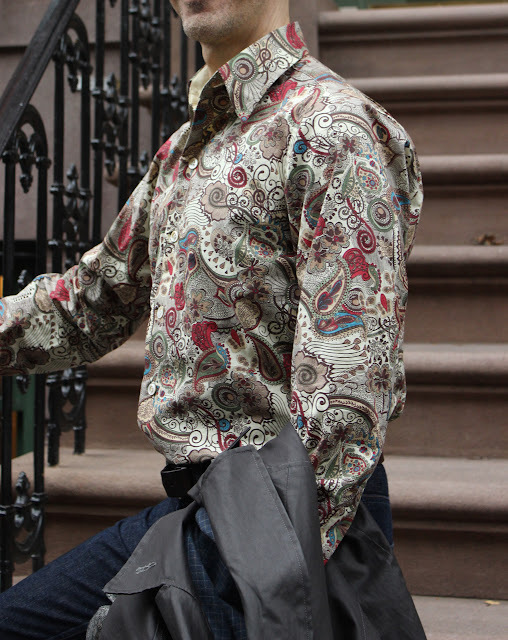 I love paisley shirts on men (and women). As always, your work looks impeccable! Thanks for sharing it with us. What a great post. The shirt is amazing, but the story behind it is the real star of the show. I think the fit of that shirt is better than anything I've ever seen you in - and that's saying something! Amazing. no, it screams well-tailored and beautiful!!! And it looks really good on you!!! The placket on this shirt is similar to what, at FIT, was called a "simple turnback placket" (i.e,, not an applied placket). It's like a facing that's folded under twice, if that makes sense. 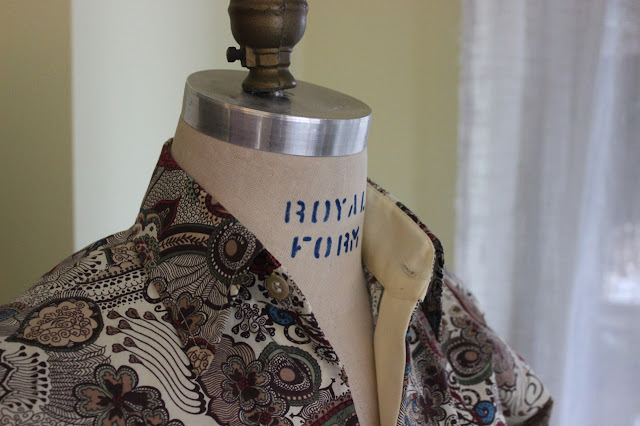 I used to only make shirts with an applied placket for the buttonholes (the left front on a men's shirt) and then a turnback placket on the right side for the buttons, which I'd stitch down. Then, when I took the FIT shirtmaking class, we used only simple turnback plackets (both right and left) and we didn't stitch them down. The buttons secured the folds on the right side and the buttonholes secured them on the left side. And I've done that ever since. I also don't like the look of those vertical stitch lines. Thoughts... doesn't the front placket question go along with decisions about the collar and the style/purpose of the shirt, as well as the fabric? 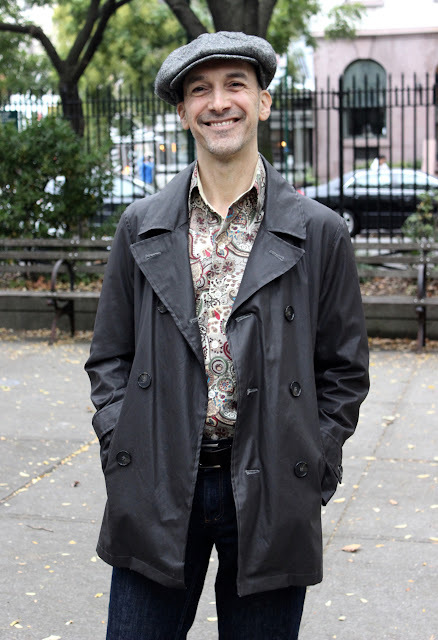 I think casual, tweedy jackets call out for oxford cloth type fabrics, stitched plackets and even button-down collars; but formal business type suits or slick european style jackets look better (in my opinion) in combination with finer woven fabrics and the simple turn back plackets, and obviously without button-down collars. 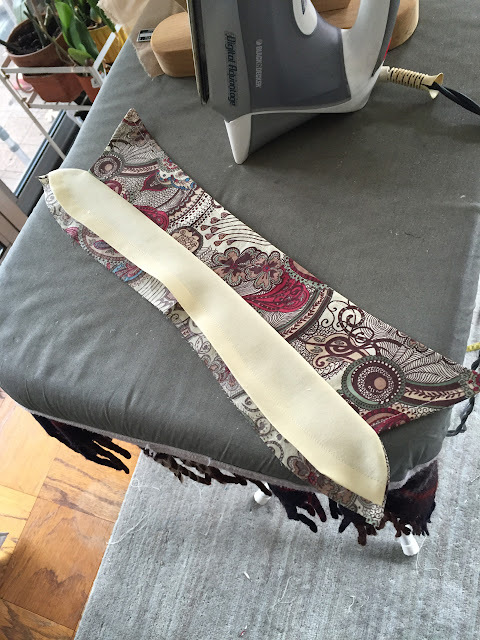 The simple turn-back plackets are certainly simpler/faster to execute, and they don't require as much fussing if there is a pattern in the fabric. I like 'em all - just depends. PB. Wow - beautiful shirt. I love paisley. Great shirt. Great back-story. Great post. "So what is the difference between a men's shirt from 1942 and one from 2015?" Um, it seems to fit beautifully without too much fiddling. Does it scream 1942? Absolutely not, thanks to your fabric choices. What a beautiful fabric! No, it certainly does not scream 1942, the differences are so minor! Love how your shirt turned out. Didn't know that about Advance. Look at you educating the masses. Paisley in my favorite colors...jealous!! Wonderful shirt. What generous friends in the sewing community. My best sewing tools have been gifts from my sewing friends. Can't beat a paisley shirt. Looks great! Thanks for showing the details of the pattern. Very interesting. So nice of you to make it up for your meeting with Erzu...Pam! Another lovely shirt, the buttons look perfect. This is a lovely shirt. I'm pretty sure it's Liberty material, my favourite! The detail round the collar and cuffs is beautiful. It's funny how the pattern has given a slightly more "puffy" finish round the sleeves and back - perhaps the fashion was a little more baggy in the 40s - I guess that goes with the whole flannels look. Anyway, it's a great piece of work and I love the placket! I love that paisley, and I am not particularly fond of paisley as menswear. Beautiful job on the shirt. Peter, this shirt is AMAZING! The color is great on you, the pattern is great, and your details are impeccable. Wow, what a great shirt! I love the shape of the collar, and that fabric is just exquisite. I love the collar insert. You definitely need to hold onto that pattern. And could you show us more about this two piece placket on the sleeve? I love how professional they look. 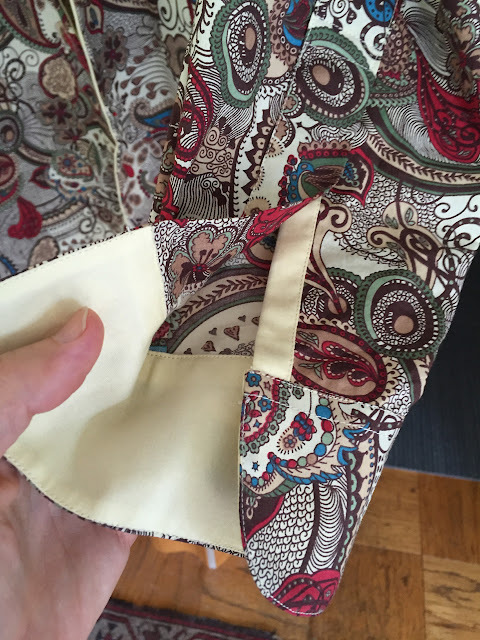 Detailed instructions on how to do a two piece placket can be found on the shirt making blog "Off the Cuff." I'm still waiting for the author of that blog to do a tutorial on how she sews her collar stands. That goes for Peter too! I have just discovered your blog and I think it's fantastic! 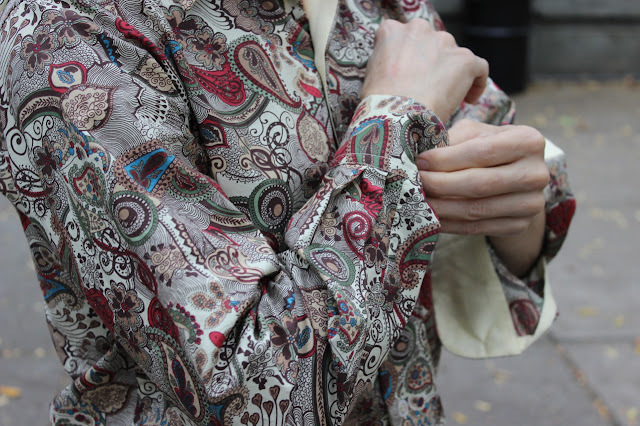 I especially love this paisley pattern shirt. I think all men should wear patterned clothes. And I am so relieved to see the adhesive tape on your vintage pattern! 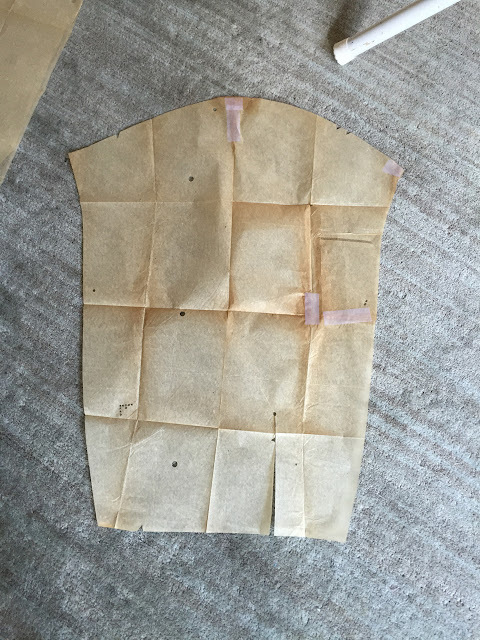 I am new to vintage patterns and I am sewing a dress. 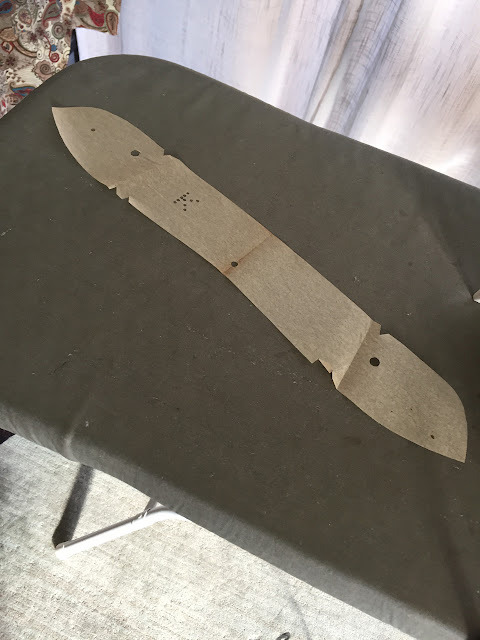 While using the pattern I had to tape one torn edge and got crazy about it. Smashing, simply smashing your 1942 shirt.